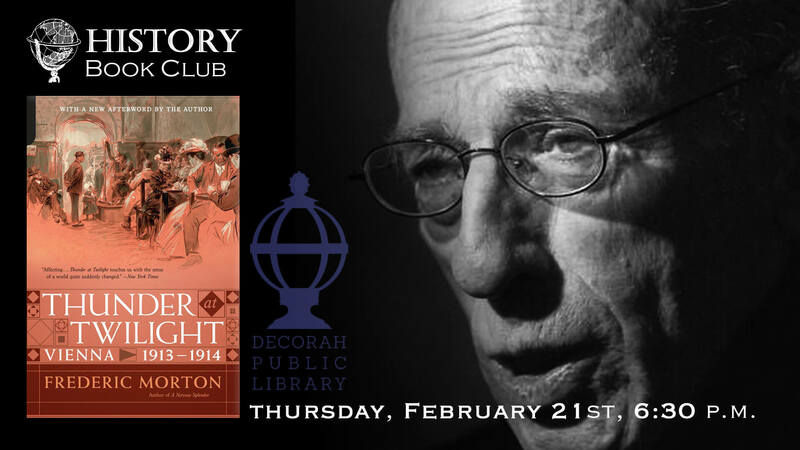 The History Book Group will discuss of Frederic Morton’s “Thunder at Twilight: Vienna 1913/1914” at 6:30 p.m. Thurs. Feb. 21st on the 2nd floor of the library. “Thunder at Twilight” illuminates two crucial years in Vienna. It was during the carnival of 1913 that a young Stalin arrived on a mission that would launch him into the upper echelon of Russian revolutionaries, and it was here that he first collided with Trotsky. It was in Vienna that the failed artist Adolf Hitler kept daubing watercolors and spouting tirades at fellow drifters in a flophouse. And it was here, shortly before his assassination would trigger the Great War, that Archduke Franz Ferdinand had a troubled audience with Emperor Franz Joseph.